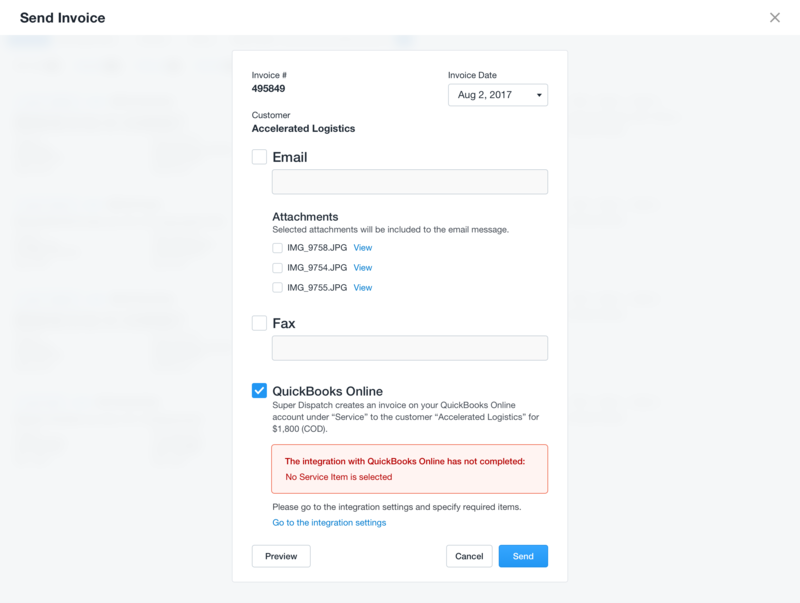 What do you do if you have any error messages with QuickBooks Online — what do they mean? Several Error messages are outlined below, please follow the instruction to fix the error. Error 1. "No Service Item is selected". 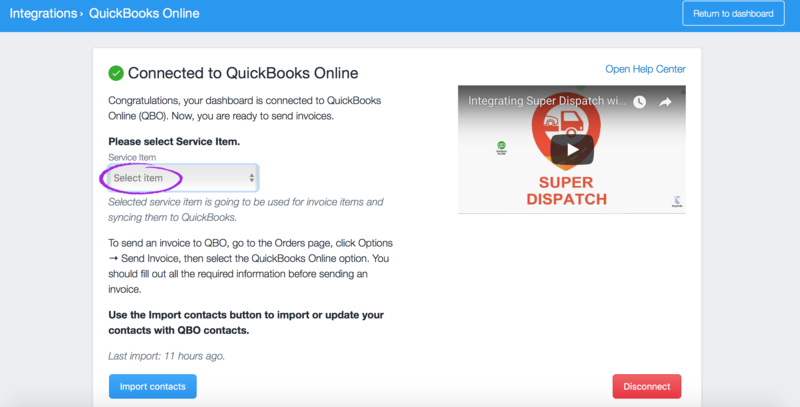 It means that you didn't select a Service Item while integrating QuickBooks Online with Super Dispatch. Solution: Go to QuickBooks (next to settings on dashboard), click to Manage Integration, then Select Item. Error 2. "COMPANY NAME" not found. Please go to QB Online and create customer with this name and try to send the invoice. 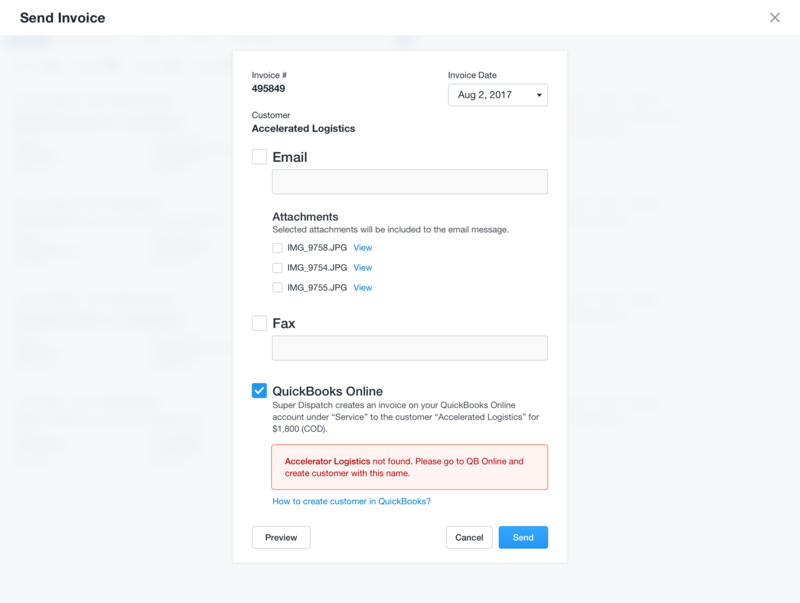 It means that the customer you have doesn't exist in your QuickBook Online. Solution: Click to Edit Order, add the price and Save the info you changed. Error 4: ''No Invoice #"
Solution: Please click to Edit Order to manually add the invoice number to the "Invoice ID" field and Save the info you changed. Or you can set automatic generated Invoice ID numbers from Settings. Error 5: ''No Customer/Shipper Information"
Solution: Please click to the "Edit Order" button, add Customer/Shipper Information, click to the Save the info and try to send the invoice.